(Updated to add the following piccie etc) Just quickly popped over to see if any new exchanges had been received on the SBEBB, and it looks like Annette has received the biscornu I stitched for her … as I mentioned before, it turned out to be a lot bigger than I expected, but it still looks OK. I used a DMC variegated thread (which is one of my favourite colourways) and added some beads for extra effect. 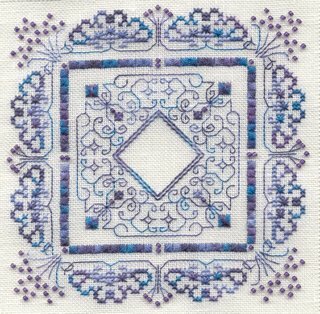 It’s another conglomeration of a few designs – the infamous Indigo Rose freebie that I can’t seem to get enough of just lately (you may recognise elements from my pinkeep in the centre) – as well as part of a cushion design in a Stitchers World magazine from years ago (Earth Laughs by designer Anne Stanton). I ended up leaving off the tassels because it looked too fussy. Here is the photo of the finished front, and the actual stitching (I won’t bother showing the back). I can’t believe that’s all there is to go now, before I fly out – 3 sleeps, woohoo!! And during my visit I’ll hopefully be meeting Nicki and Kerry from the blogging world in Auckland – that will be wonderful! 😀 As well as that, I’ve got an appointment set up already for me to see my old Physiotherapist, who is going to manipulate my back/neck and hopefully help to get it back in alignment again – I used to see him just for 1 or 2 visits yearly, and that would get me through the whole next year … but I haven’t been for 2 years now, and my neck has been giving me grief for months now – every morning I wake up with neck pain and feel like I haven’t slept properly … and sometimes the pain wakes me up during the night … can’t wait to get that ‘clicked’ back in again, it’s going to be sheer bliss!! Nothing really to report – there will be no blog reading tonight (or stitching, for that matter), as I’m on a short turnaround time for my shifts, ie I finish work at 6pm (and won’t be home until about 7pm), and have to be asleep by 9pm at the latest in order to try and get 8 hours sleep, as I move to my 6am shifts. I think I’ll be sleeping my first 24 hours in NZ haha. No stitching or blogging done yesterday either, as I forgot I had a training day in the city from 9-5, and met up with a friend for drinks after we finished, as she works in the same building as the training – we then decided to have dinner at the Rose Garden in Elizabeth Street … a very cheap and ‘nasty’ Asian eating place that has very very nice food – it was a great treat, and a wonderful night catching up. Unfortunately Hayles has decided to move to Perth, though, so she will be winging her way over to the west coast in July. Just means I’ll have to make an effort and go for a holiday over there – which I’d love to do, as I’ve always wanted to visit Perth. I’m still waiting for my SB&B orders to arrive – using my birthday money, plus a second treat in the next sale not long after … in both cases there is just one thing that is out of stock – one item has been “in transit from the supplier” for quite some time now (I didn’t realise you still use the Pony Express in the US haha), and the other one still on back order … there were some items in there I wanted for my last two exchanges, plus I’m getting a bit impatient, so I’ve asked for everything else to be shipped, and have the others sent later with some extra fabric I’ve just ordered (a fat 1/4 each of 32ct and 28ct Lavender Bliss). Hopefully they’ll arrive some time soon after I get home from NZ. Anyway, time to shut up and get ready for work – I’m really rambling on about nothing just to wake up, I think, and I didn’t sleep too well last night … maybe I should head to work early and pick up a cappuccino on the way to truly wake up! 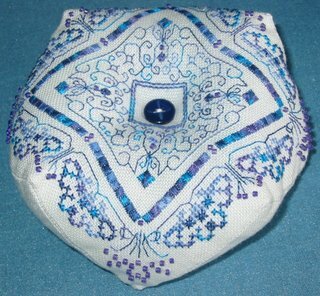 Anne S • This entry was posted in Cross Stitch, Exchanges, Finishes and tagged Cross Stitch, Exchanges. Bookmark the permalink. ← A mixed bag of allsorts! Thank you for everything, Anne. It was a fantastic package! Do you remember which issue of Stitcher’s World that was in. It is absolutely stunning! Hi Anne, the biscornu for Annette is gorgeous – I can see these becoming very addictive too, just like our needlerolls, lol). I was only thinking earlier today if the chart had arrived so I’m so pleased it has, before you head over here to kiwiland. me again,lol, I forgot to ask, what is the shade of the DMC thread you used? Your biscornu is gorgeous Anne! The biscornu is beautiful! Very pretty colours. COngrats, your biscornu is wonderfull, I love the thread you choose! Congrats Anne on your beautiful finish, the colours a gorgeous. Hello Anne. Love your work. What is the colour code of the thread you use and where can I get this pretty design. Thanks in advance.